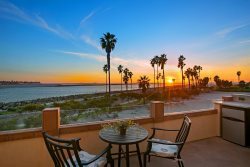 "We found Bluewater Vacation Homes on the internet while planning a trip to San Diego for our twin daughters' college graduation. We were bringing grandparents and knew that we had some specific criteria. Kendra was very knowledgable about our vacation rental and was able to answer all our questions very thoroughly. Since we were flying in from another part of the country, we wanted something that was 'move-in ready'. Our house was perfect for our weekend!! We will definitely use Bluewater the next time we travel to San Diego! -- The Schneider Family"
Reviewer Location: Las Vegas, NV - Date of arrival: November 20, 2015 - Review Rating: 5 out of 5 - Review: "What a great experience! Bluewater was so proactive and responsive. I received calls and emails before my booking checking up on me and making sure I was covered. Had to call them twice during my stay and everything was handled quickly and easily. The property was gorgeous, if anything it was nicer than the photos. Check in, access and checkout were painless and easy. I will definitely look for their properties in the future. Really loved how the property was stocked with everything we could need." Reviewer Location: Jupiter, FL Date of Arrival: August 1, 2015 Review #: 12549590 "Perfect Casita" Review Rating: 5 out of 5 - I come to La Jolla often and this was the first time not in a hotel. So glad I chose this cottage as it is right in the middle of town and the beautiful cove. Grab a glass of wine and stroll to cove for sunset, walk up the other direction and enjoy a fabulous gelato. Location can't be beat! I didn't drive much, but was able to find parking on the street when I had to. The birds are very loud in the early, early morning, but there are some fans available that can probably drown out the sound. Will definitely stay again! "We had a large group in town for a graduation of our son. The house was perfect for a group of 12 with both teenage kids and adults. Belmont Park is walking distance and plenty of options to dinning / drinks within walking distance. We would absolutely recommend to friends and family." From stay in October 2016. Reviewer Location: Sandy, UT - Date of arrival: February 12, 2016 - Review#: 14130990 "Best family vacation yet!" - Review Rating: 5 out of 5 stars - Review: "This house is beautiful and very classy and spacious. The location is unbelievable and made it very easy for us to have a fun yet laid back vacation with our 2 year old a 7 month old baby. Staff was very kind and helpful with anything that we needed. Definitely would recommend and return in the future!" Reviewer Location: Esko, MN - Date of Arrival: March 24, 2016 - Review#: 14431271 "DAWN" - Review Rating: 5 out of 5 stars - Review: "The location was excellent, accessible to the boardwalk and the beach and also minutes from the attractions of San Diego. The layout and ground level walk out worked out well and the view was incredible. It was clean and well stocked. Perfect for an ocean getaway." "Best vacation rental yet! And we we do this annually." "The Ladies" meet on an annual basis (10-12 college friends). We been to a number of places over the years. We like to rent a house so we can do our own cooking, have some privacy, but yet be close to water for walking and hiking. This beach house in La Jolla we rented from Bluewater Vacation Homes was perfect. Lots of space, ocean view in the distance, beautiful backyard garden, pool & hot tub, quiet neighborhood, and in walking distance from La Jolla beach. Everything felt clean and modern. We all agreed that this has been the best house rental yet. It was exactly as billed, even more so. The service from Bluewater Vacation Homes was great. Kendra, the person managing the details was helpful and responsive throughout. I would definitely use this company again. Review #12305796 Perfect!! Date of arrival July 2, 2015 5 out of 5 The home is VERY well appointed with top of the line appliances and furnishings. The view is beautiful and we watched fireworks of 5 locations from the patio. The home is bigger than it looks in pictures and perfectly clean. It is obvious the owners want their guests to enjoy a carefree vacation. We loved our stay and highly recommend it to others! Bluewater Properties who handle the rental exceed service expectations from the booking process throughout the stay. Reviewer Location: Boca Raton, FL - Date of Arrival - October 16, 2015 - Review#: 13451446 "Wonderful family retreat!" - Review Rating: 5 out of 5 stars - Review: "My extended family rented this property for a long weekend after our daughter's wedding in Temecula. We had a wonderful time here and used all the amenities it had to offer. The pool, spa, barbeque and fire pit were used each day and night. There was plenty of space to be together, but also individual areas to move to when you needed some space. The ocean view is lovely and the beach and cute town with shops and restaurants are only a short walk down the hill. Blue Water Vacations was very accommodating and they even allowed us to check in a couple hours early. A great experience all around!" Reviewer Location: New York, NY - Date of Arrival: November 24, 2015 - Review Rating: 5 out of 5 stars - Review: "Spectacular!" - "Centrally located very well appointed (designer quality), very modern and new. The house is perched on a hill (bird rock?) with truly spectacular 180 degree views. We are a family of 7 and fit comfortably in the 3 bedroom house. Appliances and decor is very new and modern - decor is comfortable and inviting. 3 levels of balcony offer great views. Highly recommended." Reviewer Location: Rancho Cucamonga, CA - Guest: David F. - Date of Arrival: October 12, 2016 - Review #: 16201249 - Review: "Great house location with all the amenities you would need.Very comfortable home with all the amenities you would need. Rental company very attentive to your needs. Thank you for making our family reunion a event to remember." Reviewer Location: Vincent, OH - Date of Arrival: February 18, 2016 - Review#: 1417244 "Happy Family!" - Review Rating: 5 our of 5 stars - Review: "Great place and wonderful staff. We took our young adult boys and their girlfriends (23 - 26) to visit our other son that has recently moved to San Diego. Great place for family gathering, the view was exactly what we wanted. We spent almost all of our time on the patio lounging on the furniture watching the ocean and all the interesting people on the board walk. Never a dull moment. I would definitely recommend Bluewater and Mission Beach #1 ocean front walk to everyone. Except when I want to go again, those dates are taken....."
Reviewer Location: El Cajon, CA - Date of Arrival: March 19, 2016 - Review#: 14353118 "Stay cation" - Review Rating: 5 out of 5 stars - Review: "It was quiet which was surprising considering its spring break. It's a lot of stairs so you get your exercise. Kitchen is on the top floor. The view from the deck was incredible."